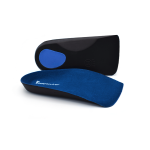 These insoles are perfect for those who want to take as much strain and pressure off their feet and lower legs as possible. 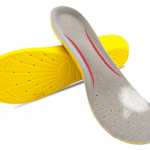 These insoles work to restore the biomechanical balance in your feet by correcting common gait problems such as excessive pronation that can result in pain and injury. They also come with a full 30-day money back guarantee which means if they fail to ease your pain you can send them back to receive a full refund. Pros: Eases as much pressure off your feet and legs as possible -Ideal for those with flat and high arches. 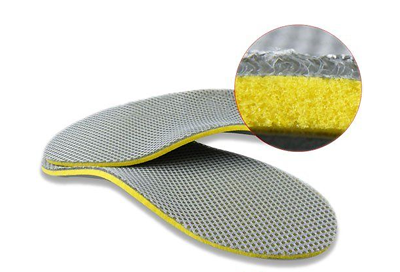 Designed to correct the most common functional problems that can cause foot and leg ache. Heel cups helps to improve stability and balance. Ergonomically made to be super lightweight so they won’t weight down your feet when you wear them. Made from durable and breathable carbon fiber with an anti-bacterial coating to prevent the build-up of bacteria and helps combats against infections. Cons: May need to be cut to size to fit into some types of shoes.